This is pretty much how my morning looks – me with a cup of strong, black coffee and a notepad with a pen to write down what I’m supposed to be doing, this morning. Under normal conditions, I’m usually out and about by this time (it’s nearly noon). But today is different. I’m more tired than normal, and I have a lot of catching up with myself to do from this past week. Getting myself together for the rest of the day, which will be all about getting my spouse together to go to the even they’re hosting tonight. It’s a lot of work. There’s a lot to remember. I don’t feel up to it, but that doesn’t change the fact that it needs to be done. I need some motivation. Something to perk me up. Then again, I think just resting tonight, spending time in my own home in solitude and peace is probably motivation enough. It’s been months, since I had any time to myself. I’ve almost forgotten what it’s like. I think tonight, I’ll spend some time organizing my study. I have a whole room with books and workspace(s) for myself, but I’ve taken to using it just as a storage area, where I put things I don’t want to think about anymore. That’s gotta change. For sure. So, I’ll do that tonight. It’ll be a really good use of time. And now, out I go into the world today. It’s cold and windy and clear, and I have trash that needs to go to the dump. Recycling, too. And I’ve got to run to the store to get some supplies for tonight. It’ll all get done. I just need to rouse myself and get my act in gear. Well, that sounds dramatic. And I suppose it is. Taking care of the present sounds so formal. It seems common-sense. And I suppose it is. But we live in a non-sensical world, these days, so it’s a lot more difficult than it seems like it should be. Kick-starting my future is something I do — or don’t do — each day, with every choice I make. It’s a lot simpler than it sounds, and it’s a lot more complicated than it seems. The thing is, we do this each and every day with the choices we make. We define our lives by our choices, and we further our plans with our actions. It’s not mysterious, it’s not magical. One thing leads to another, then another, then another. And all along the way, we have the chance to change direction, even slightly. If you’ve ever thrown a ball, you know how wide of the mark you can go, if you alter the angle of your arm just a little bit. The same is true of our lives. One slight change in “angle”, and you can end up in a very different place than you originally intended. A “little” slip on some stairs… a “minor” bump on the head… and your life can change in that instant. You can find yourself waking up each day, not knowing where you are, exactly, or where you want to go. Or you may wake up each morning wondering why the heck you didn’t get to where you were going the day before. The brain is an amazing thing, and it’s surprisingly easy to disrupt in life-altering ways. We constantly take it for granted, like electricity or hot-and-cold running water. They’re all supposed to just work, just be there. And when they don’t… when they’re not there, we’re thrown into a state of chaos and confusion that blocks our ability to deal with anything. The thing is, we tend to get stuck at that place of chaos and confusion. Perhaps because brain injury “rehab” is big business, with plenty of facilities billing plenty of hours to insurance companies, we don’t see a wholesale rush towards figuring out brain injury the way we should have long ago. Too many facilities make their money from people in need of help, rather than getting people back on their feet, never to need them again, so where’s the impetus to properly serve the brain-injured population? There are lot of us, with over a million TBIs added to our numbers, each year in the United States, alone, so I’d expect someone, somewhere to figure out how to end the suffering and teach people how to get back on their feet. Well, never mind. Because there’s nothing I can do about that. What I can do is share my own experiences for everyone who’s interested in actually doing something about their situation, rather than staying stuck in something that can actually get fixed. We all need a good dose of reality, when it comes to brain injury. That goes for health care providers, as well as those of us who get hurt. The brain is highly vulnerable. And the ways it’s most likely to get hurt are ways that hit us where it hurts the most — in our executive functioning, in our ability to plan and follow through, in our accustomed patterns that fall apart and plunge us into a steady state of anxiety… which builds up over time and impairs our ability to heal over the long term. When we understand the true nature of brain injury (and don’t just get caught up in recycled notions that came from investigations done back in the infancy of brain research), we can also see that it is survivable. We can — and do — recover from brain injury. No one can take that from us. No one. Not any of the “experts”, not any of the scientists or neuropsychologists or psychiatrists. The thing is, “recovery” means more than just restoring prior functionality to the injured brain. ‘Cause people, once the connections in your brain are disrupted, they stay that way. You can’t rewire broken connections. But we can — and do — create new connections that may function a little differently, but are still every bit as useful (sometimes more useful) than the old ones. And ironically, in my case, I find that some of my new connections are much, much better than my old ones, because I formed them with more life experience than before. What we’re recovering is our personhood. Our dignity. Our self-respect. Our individuality. 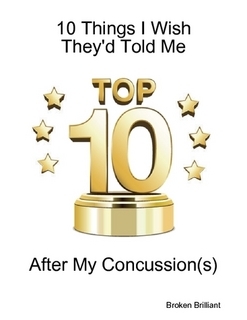 I think the brain injury rehab industry lacks an understanding of how much more important that is, than any level of physical or cognitive processing. People get hurt all the time. We break bones. We get cut up. We get smashed and smooshed and crushed. And then we recover. We may not have full range of use after we heal, but we get on with our lives. We may limp along or not be able to reach over our heads to get stuff or have to stop shoveling our own snow, but that doesn’t keep us from living our lives. Same thing with brain injury. We may not restore our brains to their former glory, but we can adapt. Losing certain brain functionality is not the problem with TBI recovery. It’s losing our Sense-Of-Self that does a number on us. It’s the panic that sets in when we find ourselves doing things that are “unlike us”. It’s the repeated little shocks of being surprised by one thing after another that didn’t used to surprise us. It’s the gradual disappearance of our friends and family who used to know us as one person, but can’t adjust to the new person we’ve become. That loss of the Self, that erosion of security about who we are… that’s the biggest hurdle to overcome with TBI. Because if you don’t deal with that, your functional recovery is going to lag. Brain injury recovery is a re-learning process. It’s all about re-training the brain. And if you’re totally stressed out over everything, you can’t learn properly. It’s that simple. And it’s that complex. And it doesn’t need to be the big-a** mystery that we make it out to be, because it has to do with the braaaaiiinnnn. Brain injury recovery is a matter of living your life. Learning to live your life. Teaching yourself how to get on with things, when everything looks different, feels foreign, and doesn’t square with how everything used to be. It’s about choice. Action. Reaction. Learning. Adapting. And when we tend to our present, choosing to learn from each and every conscious moment, we move ourselves towards a future of our own making. As the current year winds down and the new year approaches, I hope you can own that, yourself, and — whether your brain is injured or not — take responsibility for a future you can absolutely positively make up as you go along. Constructing my gratitude, one piece at a time. 10. The time and freedom to take afternoon naps – every single day. Thank you for your service, USA veterans! Memorial Day. Thank you to all the vets (living and passed on) who have sacrificed so much for us. We literally would not be here without you. I just wish you had a nicer day, instead of all the rain and cold. Then again, if you’re like me, you welcome the downtime. And you can use a break from the rest of the world. This is your day. You should enjoy it. I’m staying off Facebook today. Twitter is another thing, but Facebook has gotten too volatile for me, of late. I need to rest. I need to sleep. Nap. Take it easy. And let my frazzled sympathetic nervous system chill from all the fight-flight. Just chill. I worked out more strenuously, over the weekend. So, now I’m sore. And that’s good. It means my body needs to rest, and I’m more than happy to do that. I did some balance exercises this morning after riding the exercise bike, just to get myself woken up. I was going to ride a long time on the bike (I had extra dessert last night). But I got tired. Yeah, I need to rest. So, that’s what I’m doing. I have a bunch of reading I want to do, and a bit of writing I need to do, as well. Ideas I’ve got going, which I need to continue to develop. The nice thing is, I can just let them develop and not make myself nuts over it all. This is a big change for me, and it hasn’t been an easy one. For years before I fell in 2004, I had a number of my own businesses going in addition to my 9-to-5 job. I was quite prodigious, I have to say. Always on the go, always cooking something up. And I created some pretty cool products and services that other people really got some use out of. I was part of some pretty exciting ventures over the years, and even though I had a ton of fatigue and sensory issues all the time, I was able to power through them and keep going on the adrenaline alone. It was so exciting, and it was very satisfying to be part of teams working “on the sly” towards common goals. After I fell in 2004, I couldn’t keep up the pace. I tried. For years, I tried. I really pushed myself to continue to code and be involved in events and ventures. I hatched all kinds of startup plans, and I went so far as to start a formal business for one of them. I had project plans for about 20 different ventures, most of them around selling information and spinning books off into videos and online courses. But I couldn’t get any traction on them, I’d get confused and discombobulated and turned around… and then frustrated and angry and difficult to live with. So, about 4 years ago, I started backing off on a lot of those things. And I started culling the list of ventures I had planned and waiting in the wings. It was a hard change, because DOING BIG THINGS was always such a part of my identity and my sense-of-self. And no longer having a full roster made me feel lost and disoriented and un-moored. Like I’d been cut loose from my anchor and set adrift in the big, wide sea. But you know what? After a while, I realized that it was a huge relief for me to not have all those things constantly “cooking” in the background. And I realized I could actually start to relax. I became less and less reliant on Super-MEGA-PRODUCTIVITY for my sense of well-being and direction, and I actually gave myself a chance to catch up with myself. It’s taken years for me to feel more comfortable with this — and I have to admit there are times when I revert back to my old over-doing ways. But nowadays, it comes more naturally for me to plan less, rather than more. And in the end, whatever needs to get done, gets done. Today, though, not much really needs to get done. I’m chilling out. Relaxing. Giving my body and mind time to catch up with themselves. Without pressure. Without agenda. Just so. Author brokenbrilliantPosted on May 30, 2016 Categories Personal Experiences with TBITags books, day off, life, Memorial Day, naps, reading, recharge batteries, relaxation, rest, sleep, Thank You For Your Service, writingLeave a comment on And now I can rest.